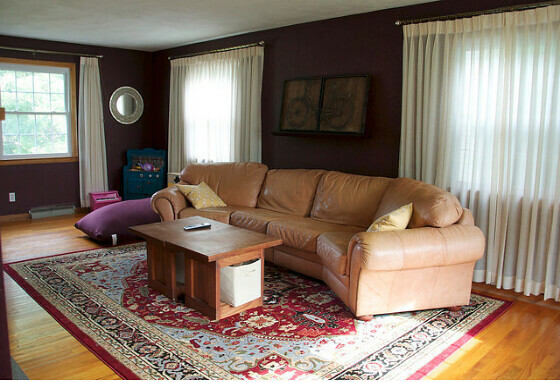 We’ve tackled the dining room and the kitchen + cabinets, but the living space on our first floor has remained relatively untouched since we moved almost a year ago. It all started when I decided to look for cat-proof blinds for the space and didn’t turn up anything. In our last house, the cats systematically ruined 80% of the blinds we put up, so I didn’t want to go down that road again. After some research, we chose faux wood plantation shutters from Home Depot. Since they’re stock versus custom, the price point wasn’t quite as shocking. The best part? The cats don’t have any strings to gnaw on, so I figure they’ll stay in good condition for a long time. 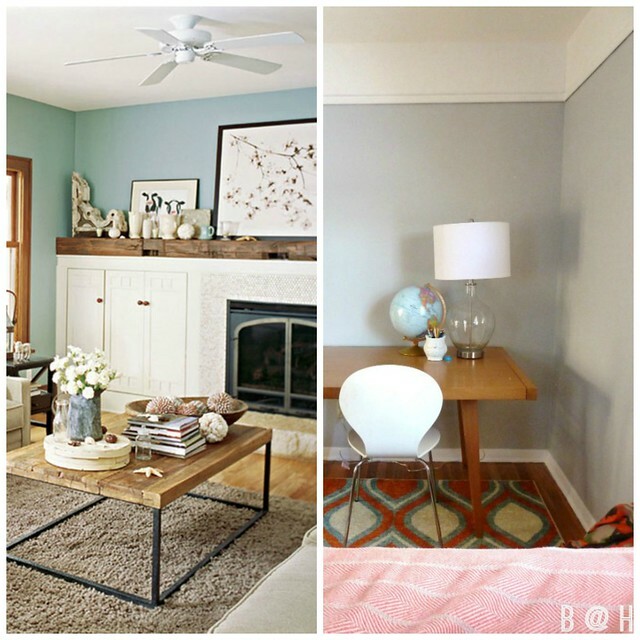 Since we knew they’d darken the room (we went with wood versus white to match the wood trim in our house), we painted the room in Revere Pewter to match the kitchen and dining room. So, once we got all the shutters up, the living room looked . . . too mature. Something about all the wood and made it look quite dated and dark. 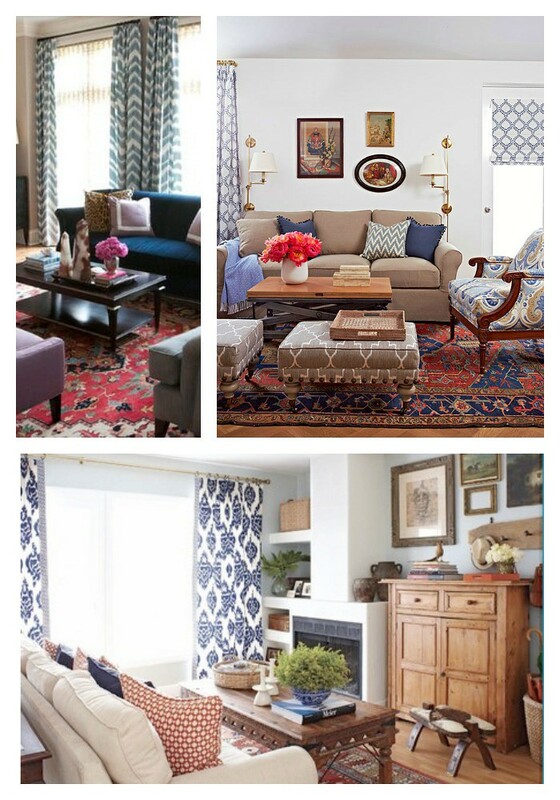 I went on Pinterest before anything else looking for inspiration for how to mix up a room with an “oriental” rug. 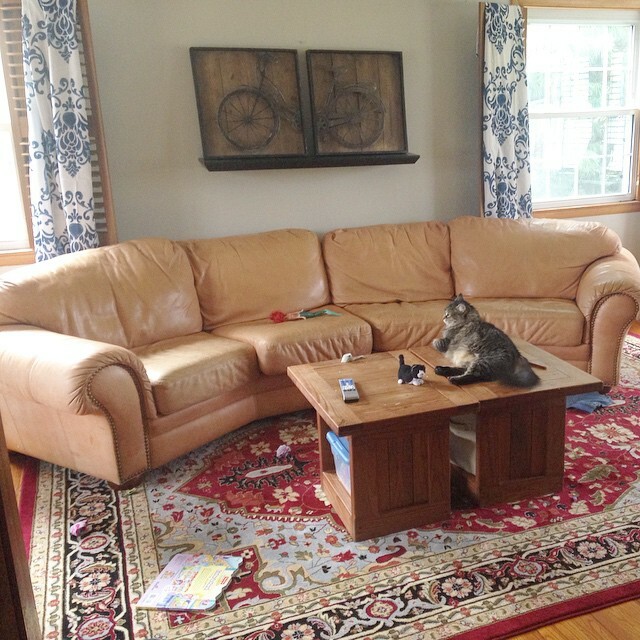 (I got our 9x12 lookalike on Overstock.com for less than $300.) I have no idea what I’m doing -- especially with pattern mixing -- so I needed some guidance, that’s for sure. We haven’t finished painting the walls and haven’t actually put up the curtains. But I’m liking it so far. At least I think. I’ll admit it looks a bit crazy, and there’s still work to getting it all fitting together the “right” way, whatever that means with home decor. For example, the curtains aren’t perfect. I’d prefer some in a true ikat design, but these guys were only $9.99 a panel at the Christmas Tree Shops -- why not? I’m spray painting the old brass curtain rods and hardware a rubbed bronze color, btw. Other plans for this room include some fireplace freshening. I’d like to paint part of it white and make the mantel chunkier somehow. Maybe some faux crown molding. Just painting the top several inches of the room white and then adding some inexpensive molding pieces for added impact. And then accessories, etc. I’m sure the room won’t be officially “done" for quite some time due to budget, etc. -- but it’s coming a long way from its original state. I really hated those 1980s pleated curtains. 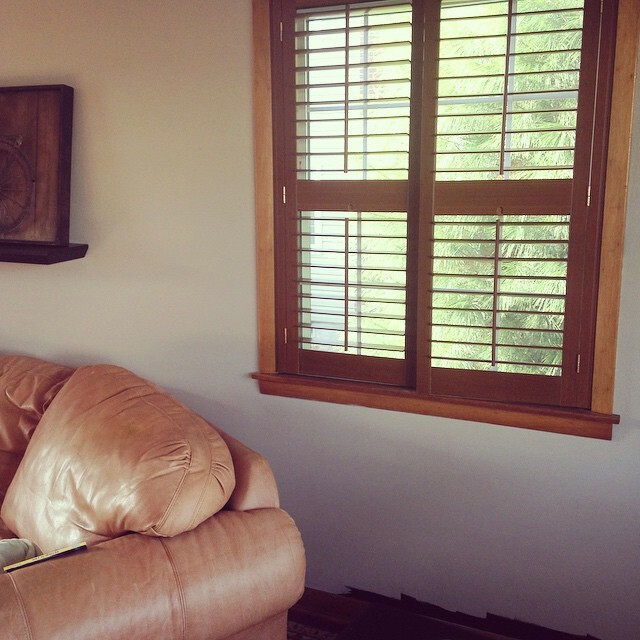 The shutters are already so amazingly functional, and we’re really happy with them! I can’t wait to update with the finished look.